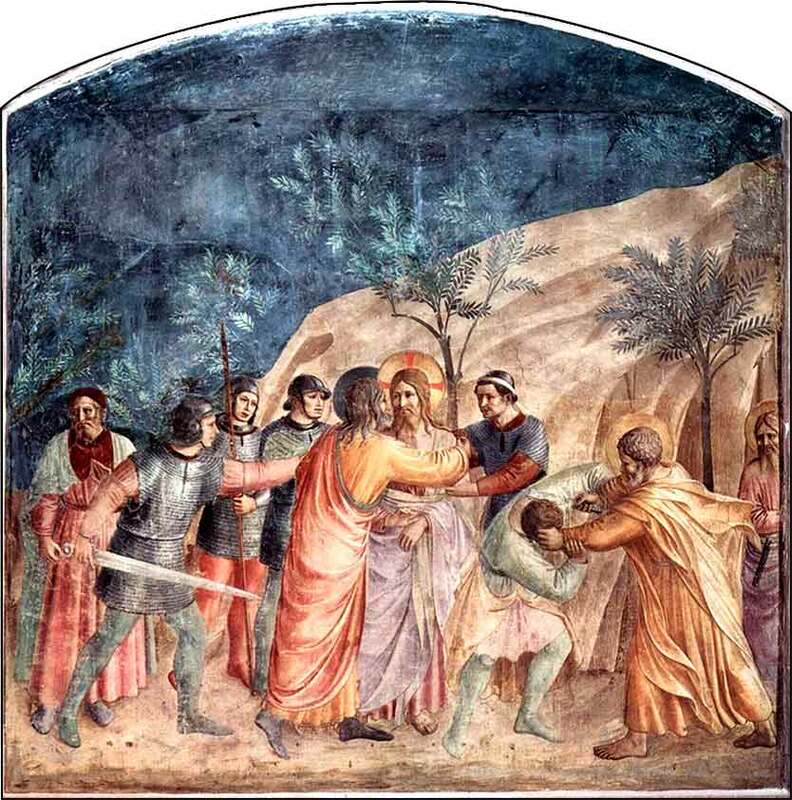 Capture of Jesus by Fra Angelico, ca. 1440. 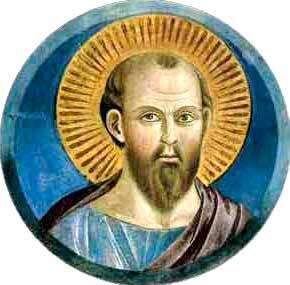 St. Peter by Giotto, ca. 1295. Then they came up and laid hands on Jesus and seized him. And behold, one of those who were with Jesus stretched out his hand and drew his sword and struck the servant of the high priest and cut off his ear. At that hour Jesus said to the crowds, “Have you come out as against a robber, with swords and clubs to capture me? Day after day I sat in the temple teaching, and you did not seize me. But all this has taken place that the Scriptures of the prophets might be fulfilled.” Then all the disciples left him and fled. The timing of our read-through of Matthew has us studying the arrest of Jesus the day after Easter, which might feel a bit odd. Maybe we can think of it, not as repetition, but as a fortunate coincidence that deepens our focused study of the crucifixion and resurrection, instead of trying to cram it into a few days. We will learn in John that the disciple who cuts off the servant's ear is Peter. He is throughout the Gospel depicted as the bravest and also rashest of the apostles. He was possessed of a pervasive love for Jesus and we must realize what it meant, to pull his sword on a detachment of Roman soldiers. But then, the last line: “The disciples all left him and fled.” Not even the stouthearted Peter could long stand and face certain death, once Christ was arrested. The behavior of Peter and the disciples, from this time through the Pentecost, informs the nature of Christian courage for all ages. It demonstrates the courage that can come from God. We see Peter break when God, in the person of Christ, is taken from him; but as Christ has promised, the Holy Spirit will be sent to the disciples, and we will see a dramatic return of both moral and physical courage, beyond that which they possess by nature, when God returns to them in person as the Holy Spirit, the “Paraclete”. In other words, the apostles have a normal amount of natural courage. We will be able to see how they behave, relying on their natural courage, in the period between the arrest of Christ and the coming of the Holy Spirit, while they do not have a person of God with them. And we will thus have a baseline to demonstrate the courage that comes only from God, by their behavior after the Holy Spirit comes to dwell within them. The other great lesson of this passage is the reminder of the Sermon on the Mount (Matthew 5:38-48), when Christ orders Peter to sheath his sword. The electrifying commandment Christ gave not to resist evil, to “turn the other cheek”, is not popular with a lot of people. If one tried to pick the passage in the Bible that is the most widely ignored, passed over, distorted, and/or rationalized into non-existence by professed Christians, it would be a prime contender. 1 Corinthians 15:3 (ESV): For what I received I passed on to you as of first importance: that Christ died for our sins according to the Scriptures, that he was buried, that he was raised on the third day according to the Scriptures, and that he appeared to Peter, and then to the Twelve.